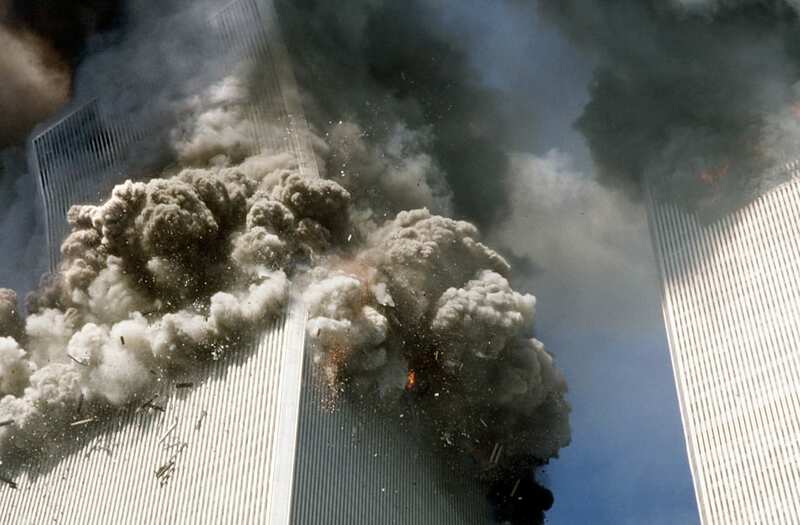 Smoke billows out of the south tower of the World Trade Center as the building begins to buckle under itself after being hit by US Airways Flight 175. 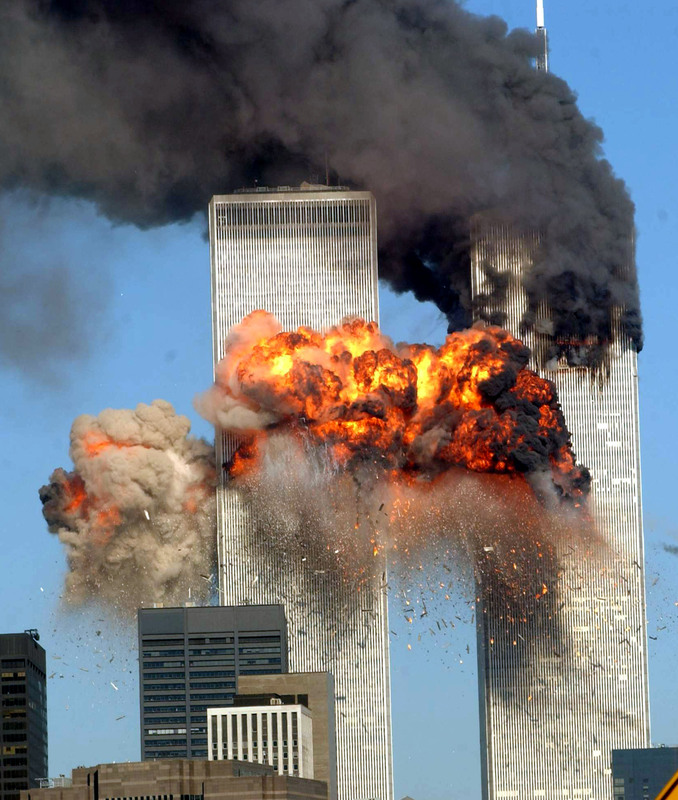 Nearly 3,000 died as a result of the attacks that day, which were carried out by 19 Al-Qaeda men who hijacked four planes and maneuvered them towards various areas of the United States. 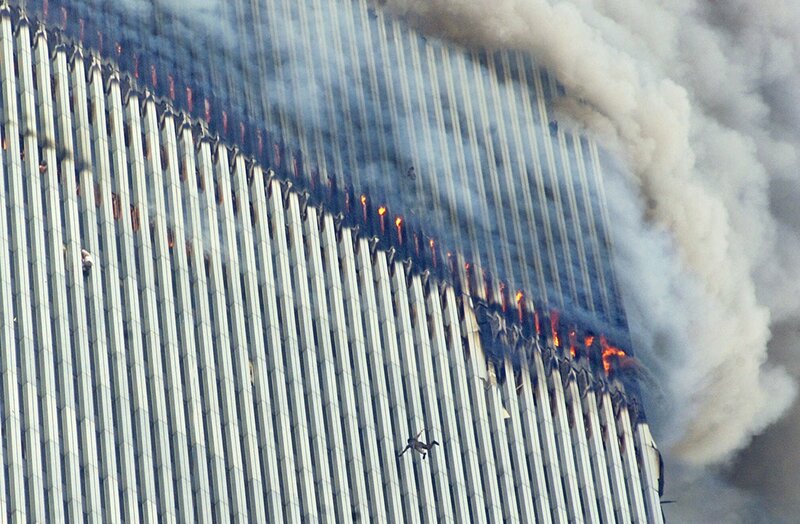 WARNING: The photos below contain graphic content of the events of September 11 as they happened. Viewer discretion is advised. Because the terrorists did not have the support to destroy the U.S. militarily, they focused on destroying "symbolic targets" instead. The Twin Towers symbolized America's economic power and success. The Pentagon, as the headquarters for the Department of Defense, symbolizes America's military power. It is speculated that the Capitol building, the legislative arm of the U.S. government, was the intended target of US Airways Flight 93. New York City is silenced as a fiery blast comes from the south tower of the World Trade Center. United Airlines Flight 175 from Boston was hijacked 30 minutes into the flight by terrorist who flew it into the south tower of the World Trade Center just 17 minutes after Flight 11 rocked the north tower. Whereas there was speculation that the first crash had been an accident, this one confirmed everyone's worst nightmare -- this was no accident. This was an act of terrorism. 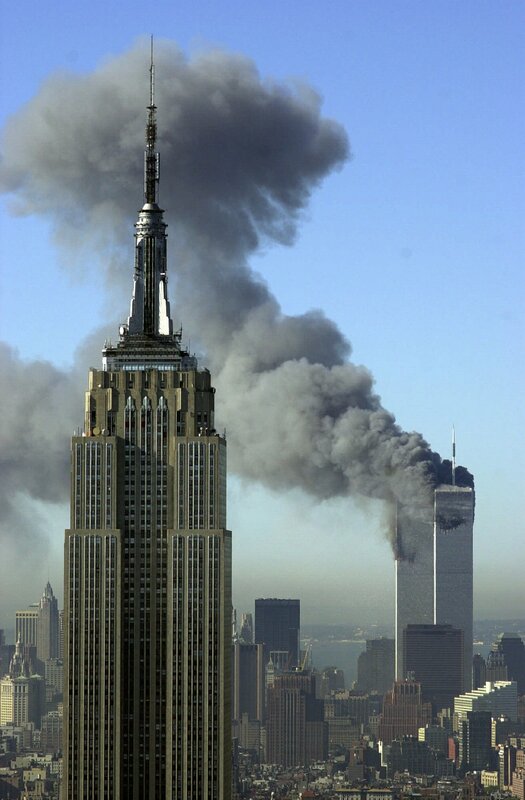 The Empire State Building overlooks the city as smoke pours out of the World Trade Center following the terrorist attacks of September 11, 2001. The September 11 attacks consisted of four planned terrorist attacks by Al-Qaeda. Two of the hijacked planes flew into the Twin Towers, one plane flew into the Pentagon and the last crashed into a field near Shanksville, Pennsylvania after passengers on the plane subdued the hijackers and veered them off course. 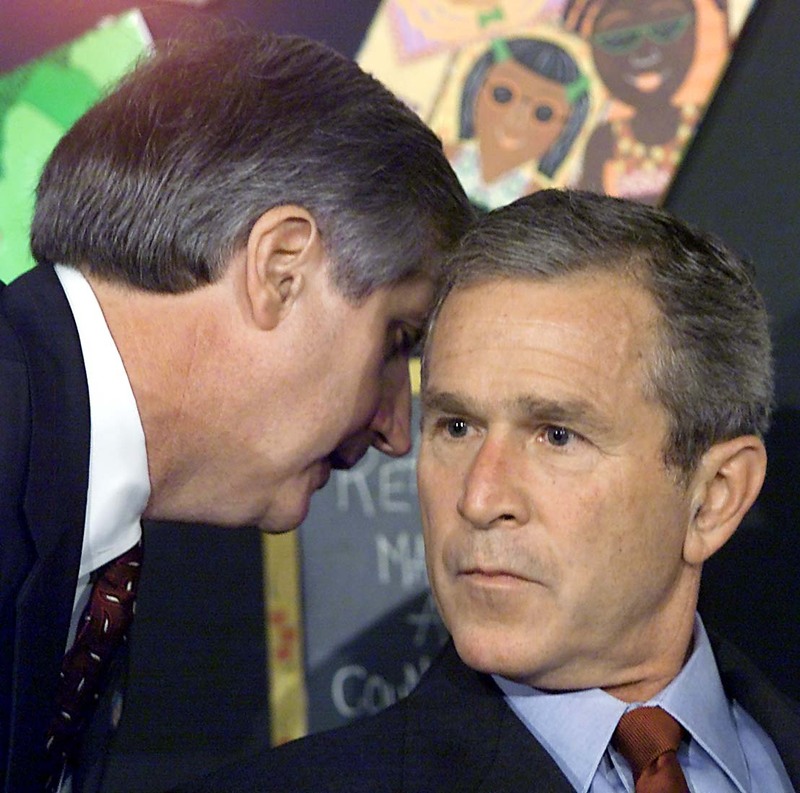 Former President George W. Bush is briefed about the September 11th attacks by then-White House Chief of Staff Andrew Card while visiting an elementary school in Sarasota, Florida that morning. Bush is steel-faced, trying to maintain his composure in the room full of children after receiving the news. Less than a year into his first term, his presidency completely changed after that day. A person jumps out from the north tower of the World Trade Center after the building was hit by a plane on September 11, 2001. On the left, another person clings to the side of the building. The north tower of the World Trade Center collapsed one hour and 42 minutes after American Airlines Flight 11 crashed into the building. Some estimate that 200 people lept out of the towers after the attacks. Nearly all were from the north tower, which was the first building hit. These powerful images of despair were some of the most graphic and disturbing pieces of footage from the tragic event. Marcy Borders takes refuge in an office building near the World Trade Center following the September 11th terrorist attacks. 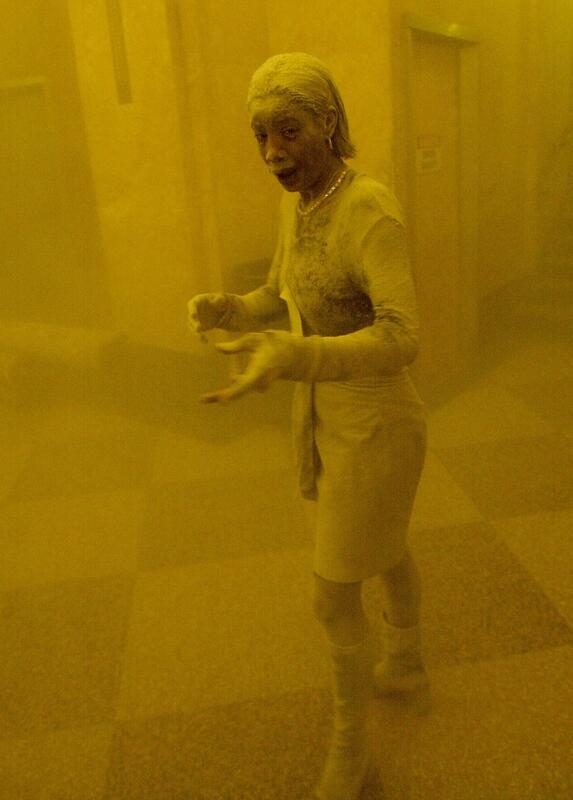 She was caught outside as dust and debris engulfed the area as she escaped from the North Tower. The woman known as "Dust Lady" because of this iconic photo recently died after a battle with stomach cancer on August 26, 2015. Borders told the Jersey Journal she believes the attacks on the World Trade Center caused her illness. CDC reports found that the collapse of the towers exposed those in the area to a number of carcinogenic materials. As of May 2015, 3,700 of the survivors and first responders within the vicinity of World Trade Centers have been diagnosed with some form of cancer. 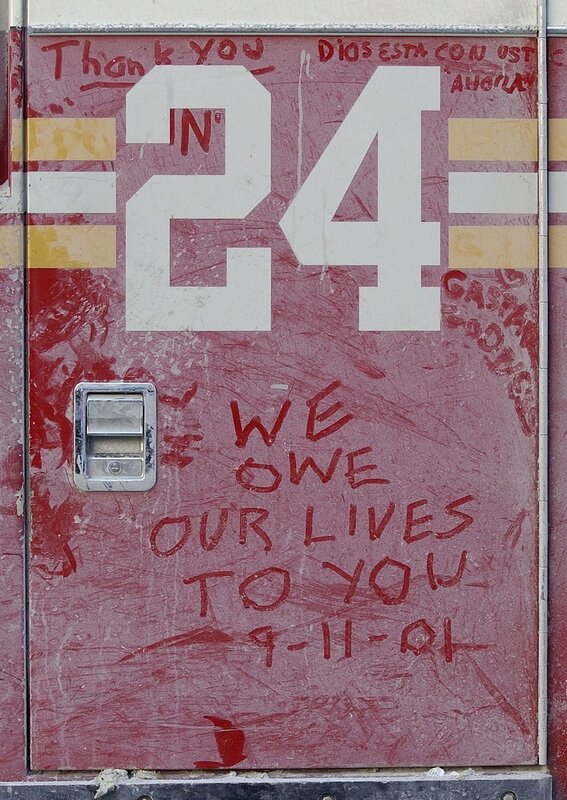 New Yorkers write messages through debris on the fire truck door for Ladder Company 24 on September 12, 2001. The ladder truck door joins a growing memorial to the crew who lost their lives on September 11. 71 law enforcement officials and 343 members of the New York City Fire Department were among the nearly 3,000 people who lost their lives at the World Trade Center site. Rubble and dust from the debris of the World Trade Center hangs in the air following the terrorist attacks on the World Trade Center on September 11, 2001. The acts that day forever changed the face of American society and spurned the nation's involvement in The War on Terror. American attitudes shifted when it came to safety and privacy. This era brought counterterrorist policies like the controversial U.S. Patriot Act, which sought to strengthen security measures by prioritizing defense and national security. The act granted federal officials to keep tabs on personal information ranging from citizens' credit card numbers to cell phone messages. 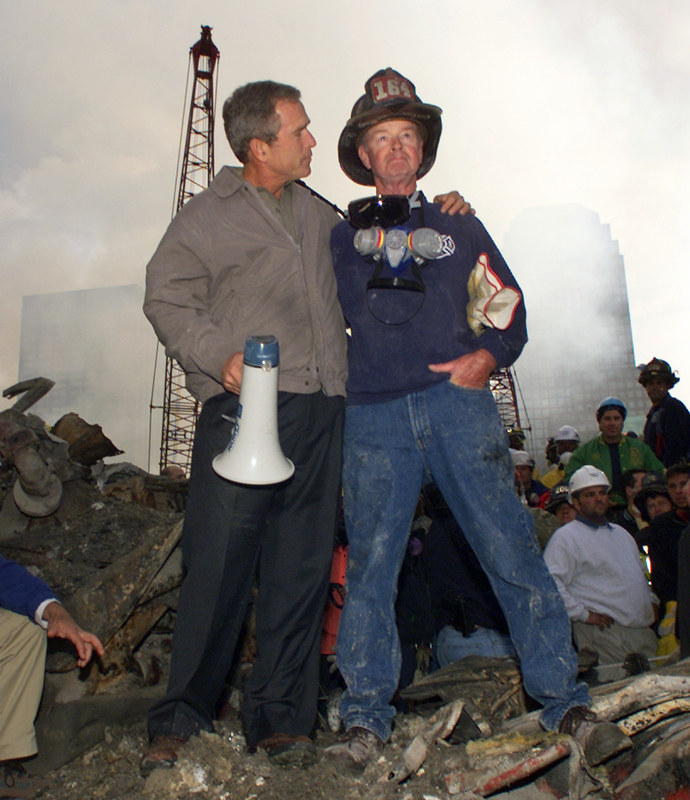 President George W. Bush stands atop the rubble where the World Trade Center one stood and puts an arm around firefighter Bob Beckwith. Beckwith was a retired firefighter who put back on his hard hat when he heard about the 9/11 attacks. The president embraced Beckwith, grabbed the bullhorn and began talking to the first responders and law enforcement officials on the scene. He thanked them for their hard work. During the speech, someone in the crowd shouted they couldn't hear the president to which Bush responded, "I can hear you! The rest of the world hears you!...And the people who knocked these buildings down will hear us soon." 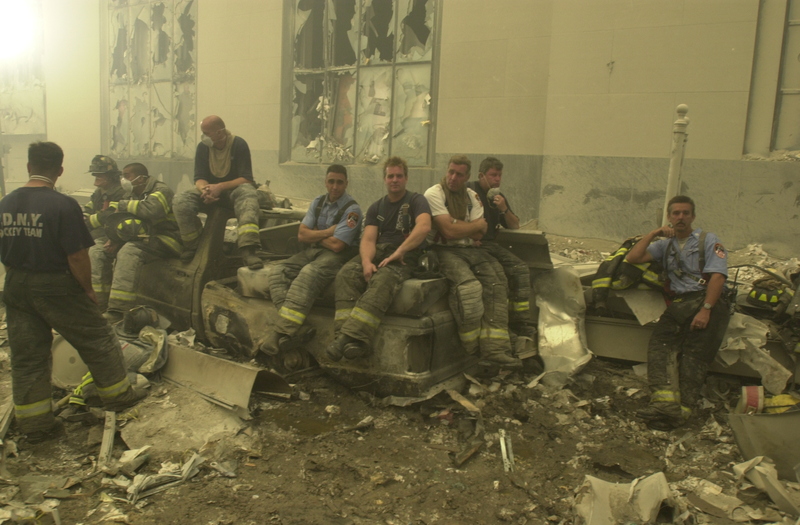 Emergency workers gather at Ground Zero on September 11, 2001 after the terrorist attacks on the World Trade Center. Reaction to the attacks from local, state and federal levels were unprecedented. While an incredibly large number of people came out to help others evacuate the area, a significant number of those volunteers lost their lives when the towers collapsed. Reporters began to attribute the area where the World Trade Center stood as "Ground Zero," while rescue personnel referred to the area as "The Pile." 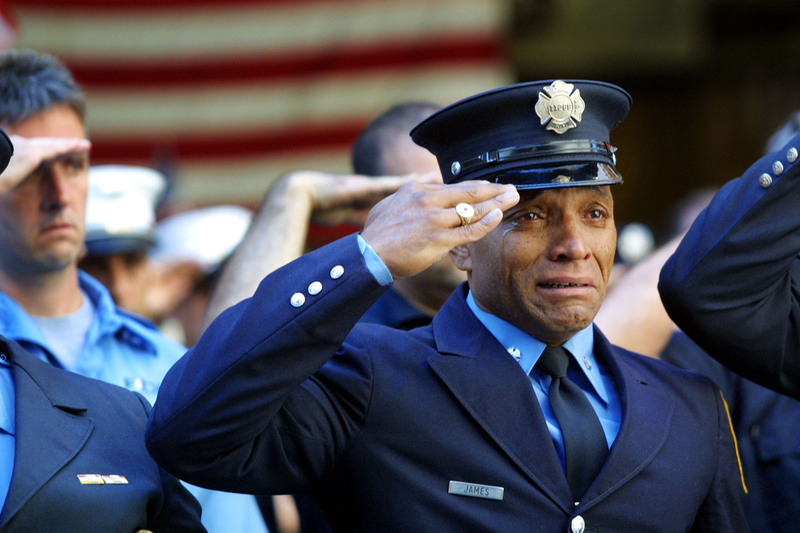 Firefighter Tony James weeps at the first FDNY funeral service on September 15, 2001 in front of the St. Francis of Assisi Church in Manhattan. Of the 2,977 victims who died in the 9/11 attacks, 415 of those were law enforcement officials and firefighters. One of those lost was New York Fire Department Chaplain Rev. Mychal Judge from Ladder 24. Judge died on September 11th while giving the last rites to another fireman near the World Trade Center. Two beams shoot up from where the Twin Towers once stood on the fifth anniversary of the attacks on the World Trade Center on September 11, 2001. 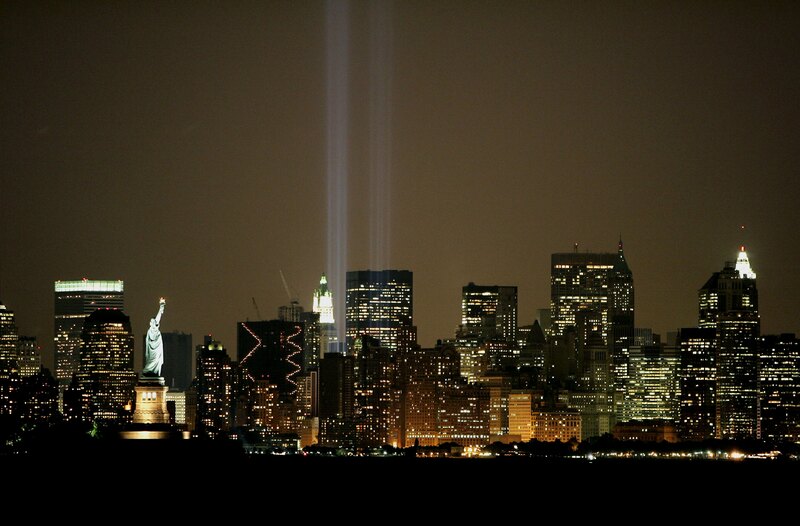 The "Tribute in Light" as seen from Bayonne, New Jersey on September 8, 2006 is made up of 88 strategically placed searchlights placed next to where the World Trade Center once stood. 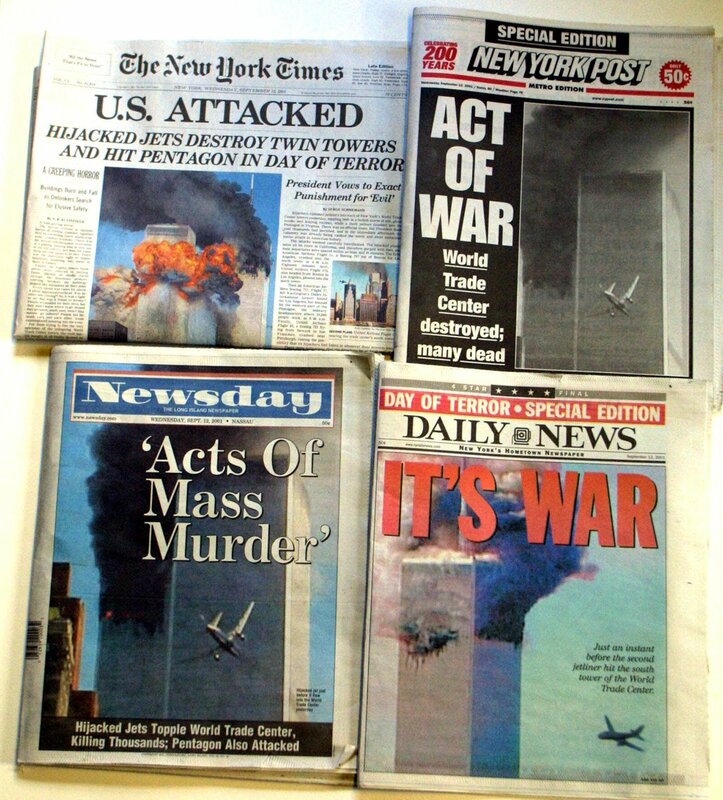 New York newspapers show coverage of the September 11, 2001 attacks. The terrorist attacks prompted some of the starkest and most unforgettable headlines and images ever seen on national newspapers. The papers may have covered the devastation in different ways but each captured the grief and despair the country was reeling in at the time. Headlines showcased an array of emotions from shock to sadness to anger. A wax replica of Thomas Franklin's famous photo is seen at Madame Toussad's on September 3, 2002. 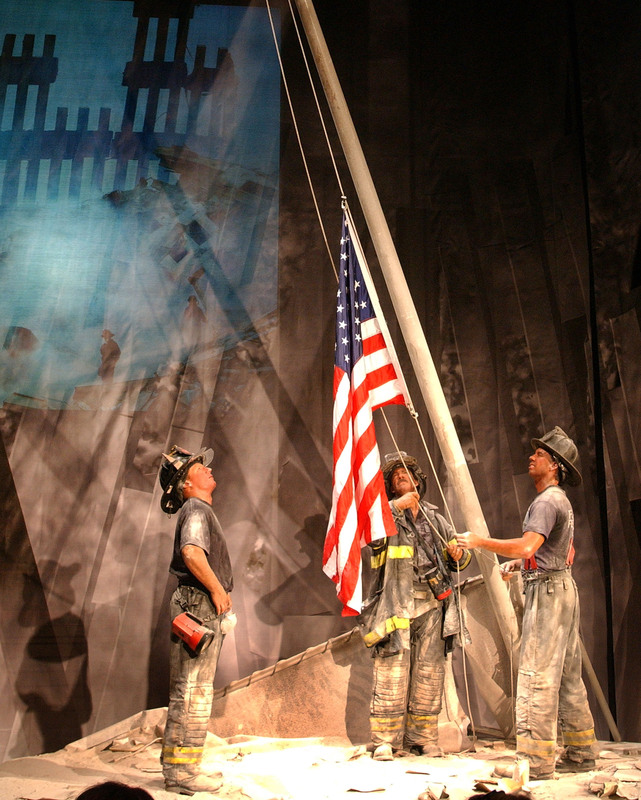 The replica was a part of a exhibit at the museum remembering the first anniversary of the 9/11 attacks called, "Hope: Humanity and Heroism." Franklin's photo, "Raising the Flag at Ground Zero" quickly became one of the most well-known images of September 11th and is often likened to the "Raising the Flag at Iwo Jima" photograph taken during World War II by Joe Rosenthal. 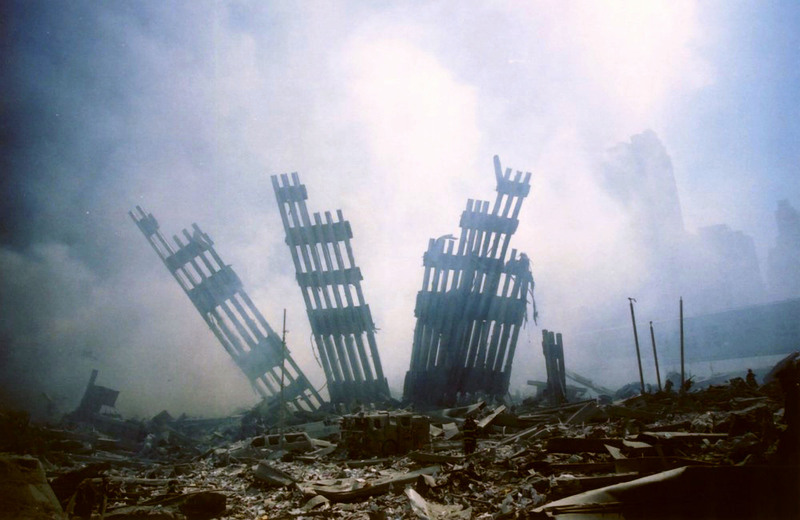 The flag in the photograph quickly became an 9/11, but has since disappeared.